Although I absolutely love exploring with my children – whether on a holiday, a weekend away or a day trip – our trip to Budapest was that rare treat: a child-free break. I have wanted to visit Budapest for some time, drawn by images of its stunning skyline and its interesting history, but I knew it would be a few years yet before our two small boys would be old enough to appreciate the city and manage wandering around on foot all day. So, my husband and I set off, with three whole days to explore Hungary’s dynamic capital at our leisure. For us, this meant walking as far as our legs would carry us, appreciating the history evident all around us, and taking our time over a drink in one of Budapest’s unique ruin pubs (and – ok, I admit – we inevitably found ourselves spotting play parks and other activities that, should we return, our kids would love!). We discovered that the city of Budapest is surprisingly large – with around 2 million inhabitants, it’s much bigger than any other Hungarian city. Sliced in two by the mighty River Danube, the unified city Budapest was once two towns: Pest, which occupies the flat ground on one side of the river, and Buda, which sits high on the hills on the opposite side. Our first impressions were of amazing architecture, grand squares and lovely parks interspersed amongst clean streets and boulevards. We also noticed that the flow of the city ran smoothly: the many different modes of transport worked well around each other, keeping everyone on the move whether by car, metro, tram or boat! 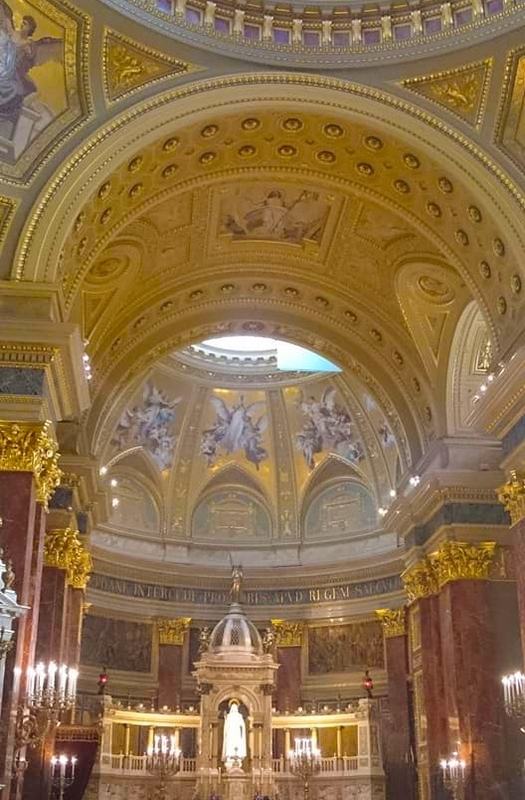 Budapest is a fascinating city to explore, in that the city’s history – both recent and long past – seems ingrained everywhere; you can learn so much about Budapest before you even step foot into a museum. One of the highlights of our trip was following the network of walking paths on Gellért Hill, which sits on the western bank of the Danube. It is home to several attractions, including the famous Gellért Baths – thermal waters situated in a grand, art nouveau setting; a curious cave church tucked deep into the rock; an imposing Habsburg citadel; and the iconic Liberty Statue, which celebrates the city’s liberation from Nazi rule in 1947. The views from Gellért Hill left me with a feeling of awe, and a sense of how sprawling the city really is. Unmissable on any trip to Budapest is a visit to the Castle Hill area. Again, this vantage point in Buda offers incredible panoramas over the Pest side of the city, with particularly good views over the spires of Budapest’s parliament building and of the many bridges which link the two sides of the city. It’s also home to many of Budapest’s historic sights. 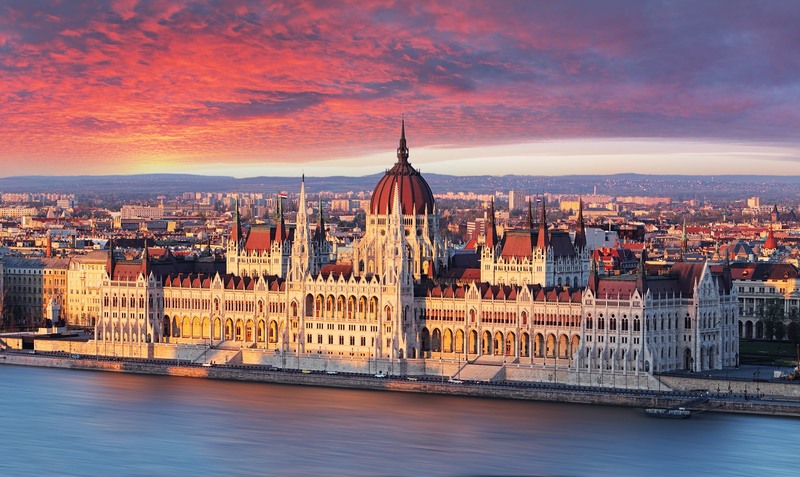 Within the medieval Old Town you can find the impressive Matthias Church, clad with a colourful chevron-patterned roof that shimmers like dragon’s scales; the lovely Fishermen’s Bastion; and of course Buda Castle itself. We also really enjoyed exploring the riverside on foot, and in this way discovered some of Budapest’s more recent past. The Danube now has many bridges, but the first built and most iconic is the Széchenyi Chain Bridge, a dramatic suspension bridge which stretches across the water. 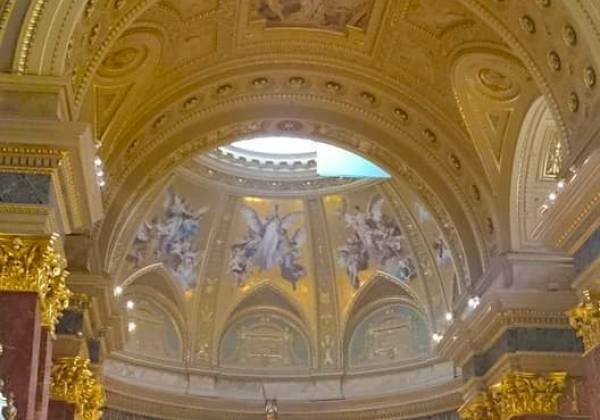 It sits at the base of Castle Hill, and crossing it to the Pest side of the city takes you close to the grand St Stephen’s Basilica. We took a waterside stroll towards the sobering sculpture known as ‘Shoes on the Danube’ – a poignant memorial to the Jewish men, women and children who lost their lives here during WWII. From here, we continued on past the beautiful Hungarian Parliament Building. This commanding, unmissable structure, built in a Gothic Revival style, is breathtaking during the day and spectacular when lit up at night. When we reached the Margaret Bridge we crossed the ironwork arches to reach Margaret Island. The island in the middle of the Danube offers a breath of fresh air and an escape from the hustle and bustle of the city, and to give our legs a break we had fun exploring by electric buggy! Having had a glimpse of the history of Budapest’s Jewish communities, it was really interesting to walk around the outside of the Great Synagogue which was close to where we were staying. A beautiful building striped in reds and golds, this is the largest synagogue in Europe and there are information boards outside: we were fascinated to learn more about Hungary’s allegiances during WWII, and the fate of many of its soldiers, civilians and Jews during this time. Without our children in tow, we had the luxury of choosing anywhere we liked when it came to eating and drinking. Yet again, Budapest’s history sits right at the surface even here, as the city is unique for its so-called ‘ruin pubs’. A trend that begun in the early 2000s, these are literally bars within ruins: buildings that had sat in a state of dilapidation for decades, following the deportation of the Jews during WWII. We visited Szimpla Kert which is the ‘original’ ruin pub, credited with starting the trend. Bohemian and eclectic, gritty and grafittied, these bars epitomise the idea of ‘shabby chic’ and are individual, artistic and a fun way to experience life in Budapest. We also really enjoyed Káravan, which is a street food market in a similar vein. Here, we sampled the Hungarian speciality lángos – a delicious deep-fried circle of dough, traditionally loaded with cheese and sour cream but also available with a variety of toppings. Whilst certainly not the healthiest of dishes, it was not as heavy as it looked! Káravan was a lively collection of outdoor alleys offering food from all over the world, and was a great place for us to enjoy the balmy autumn weather and buzzing atmosphere. Budapest was everything I expected and more: a city that wears its history on its sleeve, yet has a vibrant and exciting contemporary culture. It was an easy city to discover on foot, but we also enjoyed getting around by boat, and by any of the many other transport methods ideally situated to let you explore. Fascinating by day and beautiful by night, I can’t wait to go back and take my children there one day.